Knox Payments, an ACH-based payments company, is introducing two new innovations: Knox Assured and Knox Verified. Knox Payments is a payments and security service that allows merchants to conduct ACH payments. These are transactions wherein customers can pay directly to merchants using their bank accounts. What differentiates the service from its competitors is its primary focus on speed. In addition, Knox Payments does not offer user accounts, and simply functions as a tool for fast online checkouts. The Finovate Debuts series introduces new Finovate alums. At FinovateFall 2014, Knox Payments demoed its platform that leverages ACH to provide cheaper, more efficient payment options for merchants. Knox Payments reduces interchange fees and cart abandonment with its cost-effective and fast checkout system. Sometimes innovation is a matter of using old tools in new ways. That may be one way to think about the innovation Knox has created. “We are reducing interchange costs by doing bank payments via ACH,” explained Thomas Nicholas during a pre-FinovateFall 2014 conversation. Running payments through ACH has been possible conceptually, he adds. But until Knox’s technology, the process was too cumbersome. “We get rid of barriers,” Nicholas added. “Routing numbers, account numbers, verifications, and the wait time. We eliminate all that.” The goal is to give merchants a payment system that is fast and efficient, lowers costs, and maintains a high level of security. All for 18 cents for payments more than $2. Transactions for less than $2 are free. One interesting aspect of Knox is that while the process cuts the card companies out of the picture, the use of ACH means that banks are front and center. Nicholas explained that one big issue is that consumers make credit card payments, but banks never have access to key e-commerce data embedded in those transactions. 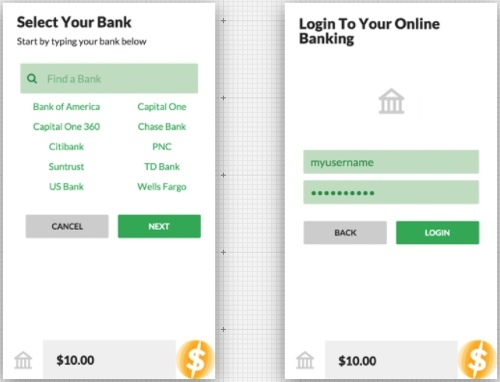 Knox changes that, by “bringing transactions back to the banks.” They use the example of the technology deployed as part of a banking app and helping to increase customer engagement and loyalty as the app becomes a shopping tool. “Banks are going to be powering payments going forward,” Nicholas said. Knox can also be used to quickly and cheaply fund accounts and digital wallets. The company’s partnership with Forex.com (more on that below) will make it much easier for traders and investors on the foreign exchange trading platform add funds to their trading accounts. Where Knox’s technology shines is the way it negotiates the typical three to four-day payment lag in ACH transactions. Knox conducts a real-time balance check to assure funds are present, which allows it to provide next-day funding to the payee. “Knox is the only alternative to the credit card network that will actually underwrite transactions instantly for half a percent and 18 cents,” Nicholas said. There are 23 banks integrated right now – all US-based. But the company expects that number to grow into the hundreds soon. The technology itself is “very portable.” Compliance and regulation remain the main barriers to speedier expansion. Many of the company’s earliest successes have been with currency-related companies – from forex brokerages to digital currency platforms. Knox announced a partnership to power the funding of trading accounts at forex broker Forex.com. With funding by credit card soon to be banned on forex platforms, and other funding options too slow and/or expensive, this service will be a time and money savings for FX traders. Knox is also working with digital currencies. Many payment processors can’t risk-rate digital currencies, Nicholas said. But Knox’s platform is “robust enough” to do the risk rating. To this end, Knox announced in October that it had formed a partnership with payment processor, Vogogo, that will make it easier its U.S. digital currency clients to accept payments from U.S. bank accounts. And a December agreement with ChangeTip will enable instant Bitcoin payments via ACH. As Knox sees it, businesses love credit cards because people know how to use them and the funds are guaranteed. Businesses love ACH because it’s cheap. Knox takes what merchants love about cards and what they love about ACH and, with some of their own innovations added in, have created a compelling alternative, especially for digital currencies working their way into the mainstream. 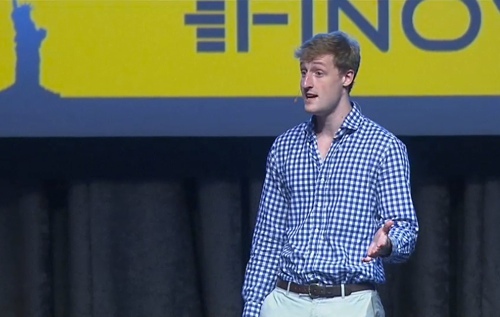 Watch Knox Payments demo its platform at FinovateFall 2014. Temenos announces availability of its new mobile banking app. Mitek reports more than 3,000 FIs have signed up for its mobile deposit solution. BBVA Compass partners with Dwolla to bring real-time payments to bank customers. Personal Capital announces $50 million series D round. 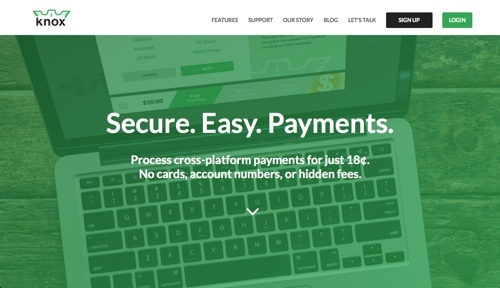 xconomy profiles anti-fraud innovator, Trustev. Fiserv launches Popmoney for Disbursements. Insuritas to open and manage turnkey insurance agency for Heritage Community Credit Union. Knox Payments recognized in emerging startup category at Venture Forum RVA event. Cardnotpresent.com features how SimplyTapp uses host card emulation (HCE). Check out Finovate Debuts: HedgeCoVest. Lendio partners with The UPS store to help SMBs. Cardlytics pulls in $70 million in Series F round, prepares for IPO. Knox Payments demoed its technology that leverages ACH rails to make transactions cheaper for merchants. 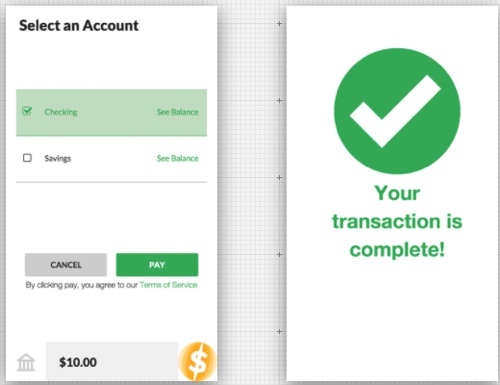 Knox allows people to make ACH payments using only their online banking login information, providing the cheapest, safest, and easiest way to accept payments.